Access to Health combines research and the most up-to-date information to encourage healthy life choices. As a teacher, mentor, and researcher, author Rebecca J. Donatelle uses her friendly writing style to address readers’ concerns and motivate them to be savvy, critical consumers of health information. The 15th Edition provides readers with new Which Path Would You Take activities that explore various health choices through an engaging, interactive, low-stakes, and anonymous experience, a new full chapter on sleep, and a new Making Change Today feature. All enhancements help readers to make health choices for a better tomorrow. Mastering™ Health is an online homework, tutorial, and assessment program designed to work with this text to engage students and improve results. Interactive, self-paced tutorials provide individualized coaching to help students stay on track. With a wide range of activities available, students can actively learn, understand, and retain even the most difficult concepts. Note: You are purchasing a standalone product; Mastering Health does not come packaged with this content. Students, if interested in purchasing this title with Mastering Health, ask your instructor for the correct package ISBN and Course ID. Instructors, contact your Pearson representative for more information. 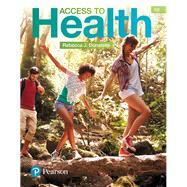 Access to Health , 15th Edition is also available via Pearson eText, a simple-to-use, mobile, personalized reading experience that lets instructors connect with and motivate students — right in their eTextbook. Learn more.